You probably all saw the two new ground bridges on Hansen's Be-Bop over the past couple of months. Those aren't the new stunts I'm referring to, though some people seem to be unwilling to ride them(!). 24" wide, a foot or less off the ground, just stay in the middle and you'll be fine. They will get us out of the mud, hopefully, when mud season returns. That area is one of the worst. 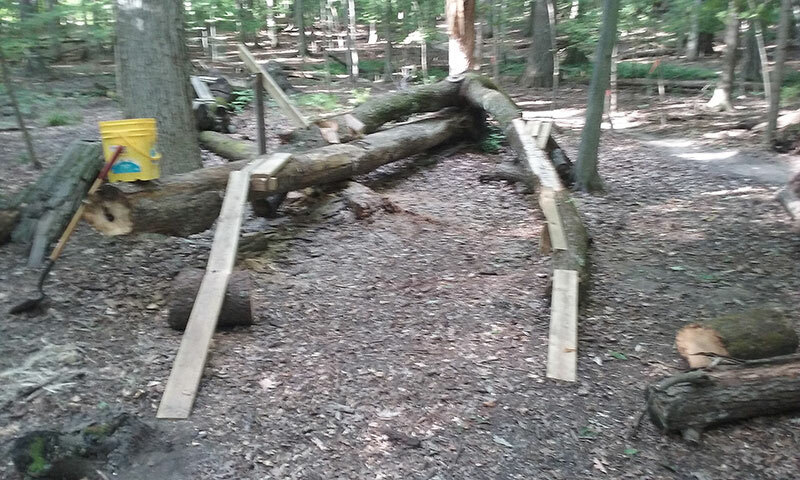 The new stunt is about 30 feet before the first of those new ground bridges, on the left (and very close to the trail) by the two big stunts. It's probably an advanced line, it's about a foot wide, 25 feet long, and goes up the fork of that one that fell there last year. At the highest point, it's probably about two feet off of the ground. It's not an easy ride, that should be apparent when you look at it. I would recommend walking your bike over it, while you stay on the ground, to see exactly where you should place your front tire in order for the rear tire to follow along properly. You'll want to get it just right, there's not much room for error. Thanks for the construction on the mud line. Here's to it ending the ever widening mud ribbons that happened this spring. The new ground bridges ride and roll wonderfully! Thanks Reid! (you can't see it in this picture), maybe make a couple of exits of varying difficulties.